"Where should I invest my next marketing dollar?" If you’ve been in marketing a while, you probably ask yourself this question each and every day. It’s the quintessential marketing question, especially for digital marketers. I’m a big fan of this question, because it contains the word "invest", and I view digital marketing as an investment. In fact, I recently wrote a post about Approaching Business As An Investor. It’s questions like this that investment-minded business professionals should be asking themselves, their teams, and even their prospective employees! So, what is the answer to this question? While there are many different approaches, the one resonates the most with me is the Marginal ROI philosophy. How does Marginal ROI work? You evaluate all of your marketing channels, programs, and campaigns, and identify those where your next marginally invested dollar is most likely to drive the largest amount of revenue. If revenue is not your goal, you can optimize against other success metrics such as sales or leads. Find the channel that will yield the most leads for the least amount of money, and that is where you invest your next dollar. The Marginal ROI way of investing in digital marketing is truly a fundamental strategy. While some advertisers optimize for impressions, clicks, position, or any other number of metrics, those that optimize with the Marginal ROI mindset are true investors, in my opinion. Don’t get me wrong, all these other metrics have their time and place, especially if you are primarily concerned with brand awareness. The investor, however, always places top line revenue and bottom line margin highest on their list. I recently read an incredibly insightful whitepaper by Kenshoo that I wanted to share on this very topic, Kenshoo’s Maximizing Paid Search Potential By Measuring Marginal ROI. In collaboration with Bing Ads, Kenshoo really gets to the bottom of this Marginal ROI way of investing, utilizing real data from advertisers. Not surprisingly, Kenshoo’s analysis illustrates that a large amount of the time, Bing Ads offers superior results from a Marginal ROI perspective. While many advertisers spend their time optimizing towards other engines, they may under-invest in Bing Ads. The data suggests that the next dollar invested should go towards Bing Ads for superior return on investment. In addition to the wonderful Bing Ads data, Kenshoo’s whitepaper also includes some incredibly helpful graphics that illustrate the Marginal ROI concept. I personally found the Marginal ROI Curve illustration on page 4 very helpful. If you have ever taken calculus in the past, you have probably seen this very diagram. If not, no worries, Kenshoo is here to teach you all the advanced math you need to know. At the end of the day, I find that the data-driven approach drives superior results in digital marketing and business, in general. Take some time to read Kenshoo’s free Marginal ROI Whitepaper and supercharge your marketing and investment knowledge! Have you heard of agile software development? If you work in a technology-focused environment, it’s likely you have. While many engineering teams used to leverage the waterfall software development model, many are now transitioning to agile. Our world is moving quickly, with flexible and fast-moving companies winning the hearts of consumers. The agile framework gives software developers the ability to adapt rapidly, while exceeding the consumer’s expectations. Given the popularity of the agile framework, one starts to wonder: Can agile be applied to other disciplines, such as marketing? Today, I’m absolutely thrilled to share The Kenshoo Guide To Agile Marketing from my good friends at Kenshoo. It’s very fitting that Kenshoo published this guide because they truly embrace the agile mantra, as a company that is always innovating rapidly to lead the forefront of digital marketing technologies. What can you expect to learn in Kenshoo’s new guide? Quite a bit, in my opinion! The guide starts off with the definition of agile marketing. Then, you’ll learn the six core values of the agile marketer. Next, you’ll enjoy studying the rise of big data and predictive marketing. 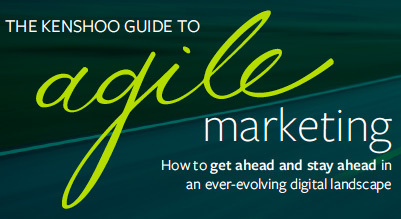 Synthesizing it all, the guide ends with tips on becoming an agile marketing organization. If you’re a leader at your company and looking to take things to the next level, I highly recommend Kenshoo’s guide. I’m always reading new whitepapers and eBooks to learn, grow my career, and add value to those around me. Kenshoo’s new guide is one that truly resonates with this scrappy, results-oriented marketer. 2015 is almost here! Now is the time to start planning your digital marketing strategy for the next year. Is big data part of your strategy? It certainly should be. Big data can be confusing. Is it just a buzz word, or does it have real implications in your marketing strategy? 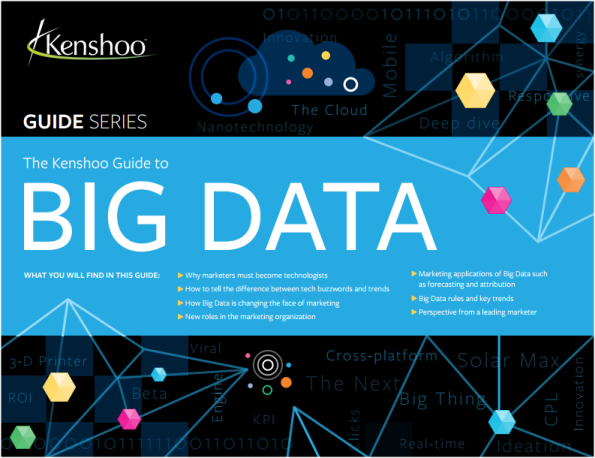 I’m thrilled to share Kenshoo’s Guide To Big Data where you will find the answers to all of your Big Data questions. Kenshoo, one of the premier digital marketing technology platforms, is a true leader in Big Data. If you’ve been reading PPC Ian for a while, you may remember that I shared an amazing whitepaper about Kenshoo’s SmartPath Technology. SmartPath is perhaps one of the coolest applications of Big Data in the field of digital marketing. Is Big Data just a buzzword or a real trend? Kenshoo tells you the truth about Big Data! Kenshoo highlights the most relevant applications of Big Data in the field of online marketing. 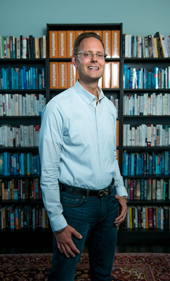 Kenshoo calls out the "8 Laws of Big Data", perhaps my favorite section of the entire eBook. The 8 Laws section ensures you keep the right focus and perspective when applying Big Data to online marketing. 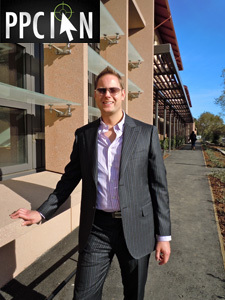 Daniel Morgan, Head of Search Engine Marketing at Accor, gives his perspective on Big Data. I really enjoyed this section since I heard the Accor team speak at Adobe Summit EMEA. Amit Golan, Senior Director of Product Strategy at Kenshoo, shares some really cool perspectives and stats on Big Data. Did you know, Kenshoo processes 85 million tracking events every day. They manage over $100 million in spend every week. They deliver 1 billion clicks per month. And, 1 trillion ads per year. Simply amazing! In my opinion, Kenshoo is Big Data! Each weekend, I really enjoy reading these eBooks and whitepapers. They always provide great value heading into the workweek! There’s been a clear theme in our industry: Everything is connected! When you’re running solid PPC and SEO programs in tandem, 1 + 1 = 3. There is a multiplier effect, especially when the intersections are managed thoughtfully. While most subscribe to the network effect of PPC and SEO, I wanted to share another network effect today, the one between Search and Social. Long story short: If you manage Search but aren’t involved in your Social program (or vice versa), you are leaving some serious opportunity on the table. It’s time to get involved! The four largest reasons why Search and Social are the next channels that should be integrated at any organization. Kenshoo makes it very clear and helps provide rationale you can leverage at your own company, as you pitch the idea. So you’ve decided to integrate Search and Social… Well, what does that look like? Kenshoo provides specific examples of Search signals for Social and Social Signals for Search. It’s a two-way street and you can clearly see how each channel complements the other. You’ll take away tactical insights on things you can do right now to amplify those synergies. Channel integrations can present challenges. I enjoyed learning about potential challenges and also solutions for those challenges. Kenshoo brings it home with advice on adding value to the rest of the marketing plan. We’re mid-year, but that doesn’t mean your marketing plan cannot change, especially as you plan for Q4 (retail vertical, anyone?). Now is the time to lock down your plan, and see how a Search and Social integration project could add substantial value to your plan. With the weekend approaching, make sure to take some time for education and reflection. Read a whitepaper each weekend, such as this one, and you will be a superstar at your company, full of new ideas each and every week! Do you Kenshoo? Kenshoo is an amazing digital marketing platform for the true digital marketing professional. You may recall, just a few weeks ago, I blogged about Kenshoo’s new eBook, Facebook Advertising Boosts Paid Search Performance. I truly enjoyed reading that study, and highly recommend it to any digital marketer considering budget allocation decisions by channel. Well, Kenshoo has done it again! 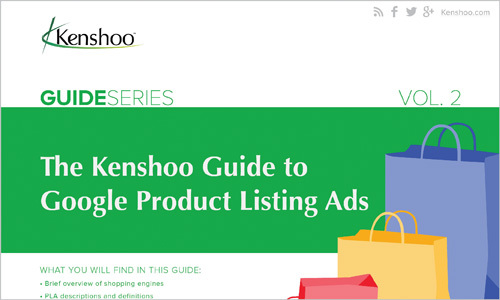 Today, I’m absolutely thrilled to share Kenshoo’s latest free guide: The Kenshoo Guide to Google Product Listing Ads. I’m a huge proponent of leveraging technologies from Product in Finance and vice versa. You can learn so much by investigating verticals other than your own, and leveraging ideas across categories. I picked up some solid tips and advice. In Kenshoo’s guide, you’ll learn all about PLAs, Google Merchant Center, data feeds, product targets, important rules, and so much more. My absolute favorite parts of Kenshoo’s guide are the 8 best practices and common PLA mistakes. These sections truly provide some golden nuggets of info. Kenshoo is one of the best digital marketing platforms around. They originally got started in the Product vertical so they know this stuff incredibly well. I highly suggest downloading Kenshoo’s free guide today to perfect your Product Listing Ad skills. Even if you aren’t in the Product category (like me), you will learn form this guide. As digital marketers, it’s all about generating new ideas. The best ideas often come from applying insights from one category to another, challenging the status quo. Elevate your PLA skills today! Does Facebook Advertising Assist PPC? Do you advertise on Facebook? How about PPC (Google AdWords and Bing Ads)? If you’re a digital marketing professional, the answer is most likely a huge “Yes!” Both channels (Facebook/social) and also PPC are great on their own. 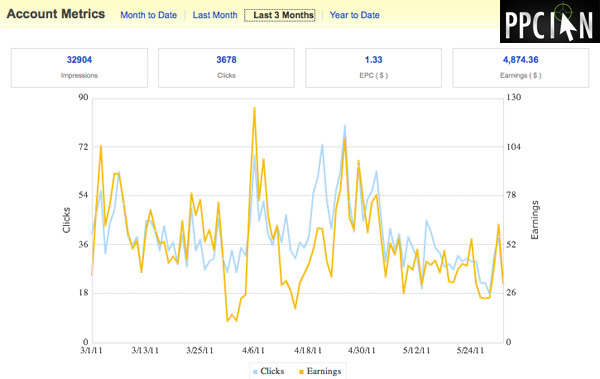 However, have you ever wondered, does my Facebook advertising impact and assist my paid search? Many of us believe so, but have never performed a formal study to prove the correlation. Thanks to Kenshoo, the leader in Bid Management Software and Social Advertising Platforms according to Forrester, I’m thrilled to share some answers. 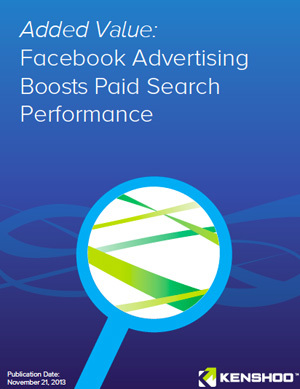 Kenshoo recently published a free whitepaper that proves a correlation between Facebook and PPC: Facebook Advertising Boosts Paid Search Performance. I’m a huge fan of Kenshoo; They are all about tracking, analytics, technology, and innovation. Long story short, they are perhaps the best company to do this type of study. They have deep roots in this type of analysis, and that’s something I respect incredibly about Kenshoo. Figuring out budgets and media allocation for 2014? Make sure to set aside some extra funds for Facebook advertising (knowing the positive impact it has on core PPC), and don’t forget to reserve funds for amazing technologies such as Kenshoo! Long time search engine marketing professionals have a huge amount of respect for Kenshoo, one of the most amazing digital marketing platforms in existence. Kenshoo Search is in an elite category of platforms and consistently impresses me (and all other digital marketing professionals). In addition to Kenshoo Search, Kenshoo also offers an amazing social platform, aptly named Kenshoo Social. If you’re a digital marketing professional that runs campaigns on Facebook and other social networks, you absolutely must audition Kenshoo Social. Kenshoo Social is not just for social media professionals, it’s for performance-driven digital marketers running huge campaigns on social networks. Today, I wanted to share a new infographic from Kenshoo Social. 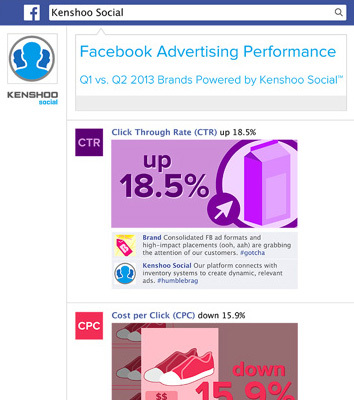 In their Facebook Ad Trends Infographic, Kenshoo Social shows just how quickly Facebook is improving from a direct-response standpoint. Comparing Q2, 2013 vs. Q1, 2013, it’s absolutely staggering how quickly Facebook is improving on metrics such as CTR, CPC, clicks, conversions, and revenue. I highly recommend checking out this infographic as a way to benchmark your own direct response campaigns on Facebook. Are you experiencing rapid improvement in your performance? Many advertisers are. As a side takeaway: Always keep testing! Something that may have not worked for you just a few quarters ago could now be one of your best channels. In addition to overall Facebook trends improving at rapid pace, Kenshoo Social also finds that Real Time Dynamic FBX Creative Outperforms Static Creative. This makes perfect sense – get as granular and targeted as possible. Your prospective customers will appreciate the customized experience and respond to your FBX ads. One thing is for sure: If you’re a big advertiser on Facebook, make sure to reach out to Kenshoo Social to see how their platform can help your program scale. I’m a huge fan of Kenshoo Digital Marketing Technology. Kenshoo provides one of the most amazing search marketing platforms in existence. Approximately three billion dollars of annual digital marketing spend is managed via Kenshoo, and they were named the leader in bid management buy Forrester. 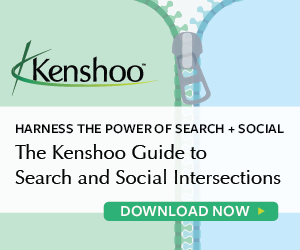 Today, I am thrilled to share Kenshoo’s new Global Search Advertising Trends whitepaper. It’s free and a true must-read. 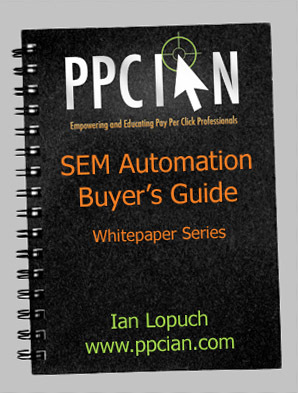 I’m a real fan of Kenshoo whitepapers and have covered several here on PPC Ian. One of my other favorites is the Kenshoo SmartPath whitepaper, all about Kenshoo attribution modeling (truly advanced stuff). So what’s Kenshoo’s latest whitepaper all about? Global Trends aggregates billions of dollars worth of data and illustrates really interesting trends in the digital marketing landscape. We’re talking about trends in budget/spend, CPCs, clicks, click-through-rates, impressions, and more. We’re talking about trends across region – US, UK, and EU. We’re talking about device-specific trends. I personally rely on such whitepapers and trends to understand the bigger picture. I found the insights Kenshoo shares about spend/budget to be particularly insightful. Thanks, Kenshoo, for another awesome whitepaper! I recommend downloading this free whitepaper and leveraging the insights at your company. Hey everyone! It’s been a while since I’ve posted here on PPC Ian. The last several weeks have been incredibly busy (in a good way). I’m now back into the swing of things and wanted my first new post to highlight a truly remarkable whitepaper: The Conversion Attribution Revolution by Kenshoo. If you are a serious online marketer, you absolutely must stop everything and read this whitepaper right now, or at least sometime this weekend/early next week. It’s 18 pages of pure education on the topic of conversion attribution. Most importantly, it will change the way you look at conversion attribution and unlock opportunity for you and your company. Conversion attribution is a hot topic in our industry and a very important lever. At the end of the day, accurate data drives great results. Accurate data powers everything we do! At its core, Kenshoo’s whitepaper introduces their SmartPath technology, a machine learning algorithm that dynamically applies appropriate conversion credit to media sources in the conversion funnel. No longer do you have to apply the same conversion attribution model across the board. SmartPath takes things to a whole new level and dynamically applies appropriate credit based on the particular customer flow in question. Kenshoo rounds up their whitepaper with two practical case studies (complete with real numbers) that drive home the power of SmartPath. I’m not going to do this whitepaper justice by writing too much more here, so I urge you to head on over to Kenshoo and download the whitepaper for free. Also, I recommend contacting Kenshoo to see how they can help your company. 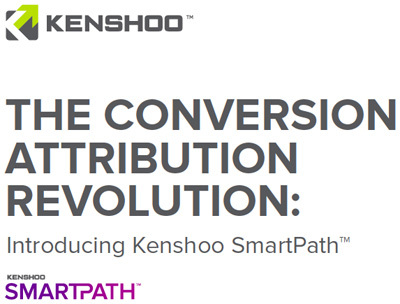 Kenshoo has been a true leader in conversion attribution for years and I’m incredibly impressed with their latest invention, SmartPath. Kenshoo has a new 16-page whitepaper and I highly recommend. It’s all about one of the most relevant and important topics within online advertising right now: conversion attribution. I read Kenshoo’s whitepaper at length this weekend, and highly recommend you download and read Conversion Attribution: Choosing The Right Model For Your Search Marketing Campaigns. 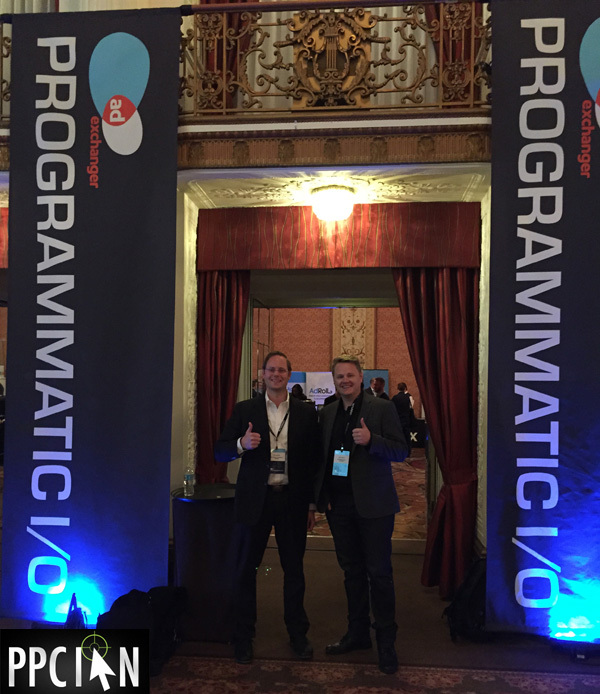 Primer and the evolution of attribution practices in digital marketing. The state of attribution has evolved tremendously over the past 10 years. Common attribution models, including first-click, last-click, linear, u-shaped, time decay, and more. I learned about some new attribution models and really enjoyed this part of the whitepaper. Three separate case studies, highlighting the application of attribution models. Specifically: Moving off a Single Click Model, Selecting a Prefer-last Model, and Considering a Multi-channel Approach. It’s always easiest to learn through example and I very much enjoyed these helpful case studies. Once again, Kenshoo has put together a seriously helpful whitepaper and I hope you enjoy it!